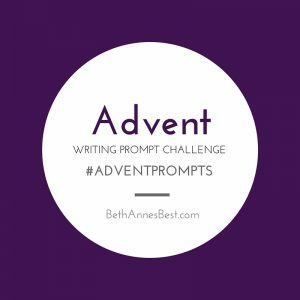 Welcome back to the 4th and final Week of the Advent Writing Prompt Challenge. This was another week of great topics! Go here to see what the topics are. Okay not really but I have such a sweet tooth it’s bad this time of year. I really enjoy baking even though I know I shouldn’t eat all the sweets. My favorite is making Butter Cookies with the Wilton Cookie Gun! I have had SOOO MANY cookie gun’s over the years that have been awful. A few years ago Jenna told me she uses this Wilton one that is awesome so I bought this one a few years ago and then the Ultra one was on sale during Black Friday or after christmas sales last year and I am in LOVE! This is the best cookie gun I’ve ever used in my entire life! All I’m going to say about this prompt is catch back up with me during Lent…. Lit the Advent Wreath at least once. Prayed the Immaculate Conception & Christmas Novena’s. Got all my Christmas Shopping done in a somewhat timely manner (still need to wrap everything). Helped put on a Children’s Christmas Pageant at Church and learned the piano songs in time to perform. Put the ornaments on my Jesse Tree. I have written about these a few times on the blog or others blogs. My favorite tradition is our Christmas Eve Traditions. We are Italian and love celebrating the Feast of the Seven Fishes. It is actually a Catholic Tradition (believe it or not). A few years ago I looked into the tradition as no one really knew where it came from. Well the people that would have known had all passed away. And I came across a lot of really interesting information. The basis of the tradition came from at one point in time you had to fast and practice abstinence to meat on Christmas Eve (similarly to Good Friday during Lent). I really like seafood and I love traditions so I always look forward to this one every year. Some years it’s just my mom and I and we won’t do 7 types of fish and just a few but it helps to keep the tradition alive. It’s weird on years when we don’t have seafood. My boyfriends family is Polish and they also do not eat meat and have fish. My mom and I are joining his family on Christmas Eve this year so it should be an interesting experience. I do not usually make any “official” resolutions. I usually come up with some “goals” or things I want to do in the year and forget about them by the time Lent rolls around. Then I make new ones. Some Catholics joke that New Years Resolutions are our practice for Lent. I have really LOVED hosting this link-up during Advent. I’m hoping to do it again during Lent when most of us aren’t as busy and have more time to reflect on the season. Lent is also a longer period of time which helps. If you share your post, photos, or videos on social media use the hashtag #AdventPrompts. Can’t wait to read everyones posts. If you link-up I will share your post on twitter and my facebook page. I look forward to reading everyones posts this week!